Investment in up-to-date, automatic, high volume manufacturing processes at our production facility gives us cost and quality control over raw materials, components and end products. This maintains our reputation for high standards in quality, value and service and helps to ensure that we deliver on time. Along with modern manufacturing facility, our development efforts are also constantly engaged in updating the product designs & incorporating latest technology in all our products. While manufacturing our range of products, special attention is given to the following parameters. Complete safety system to prevent accidents. Our production planning and control unit is aided by the latest research techniques including computerized analysis. the techniques are constantly engaged in monitoring and controlling production. Further, we are also aided by an efficient after sales service team who cater to all the service and spares requirements of our customers. These combined strengths in the power industry - upstream and downstream- have highlighted our position as an industry leader. This has assisted making us a highly functional company, engaging in R&D, product engineering, turnkey project executions and sales worldwide. Our infrastructure consists of manufacturing, warehousing, packaging, in-house quality testing and sales & marketing units. 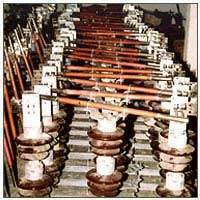 We manufacture various electrical equipment and earthing materials at our manufacturing unit situated at New Delhi. Our manufacturing plant is well-equipped with latest machinery based on cutting-edge technology that is required for streamlined and standardized production operation. In addition to this, our manufacturing unit is upgraded at regular intervals of time to effectively meet the ever-changing market trends in the most organized. To effectively handle various units of our infrastructure, we have appointed various technicians and other supporting staff.